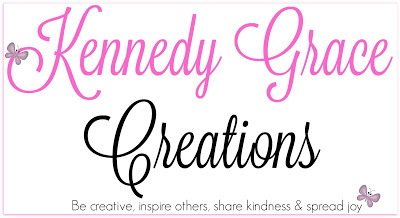 Hello, my friends and fellow crafters. It's November, so it's officially (I think) Christmas card season! 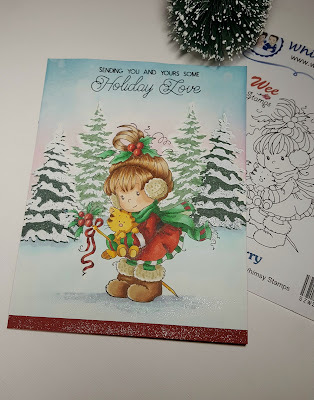 I'd like to share a Christmas card I made using a Whimsy Stamp, called Berry. I decided for the first time to enter it in the 7 Kids Create! October challenge on Facebook. Theme: Anything Goes. 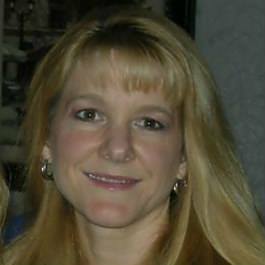 I posted it on the very last day of the challenge, and wouldn't you know (to my shock and awe) - I won!! So here's what I did to make this card. 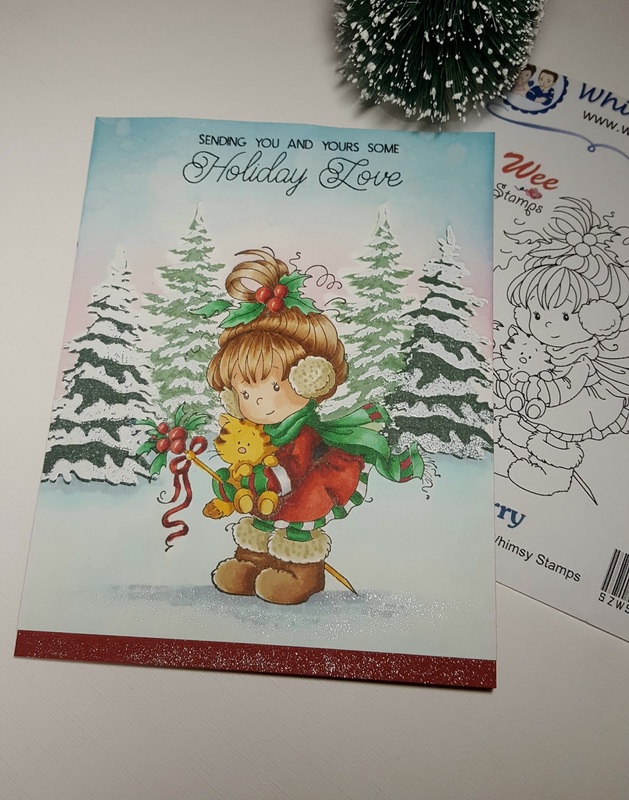 I stamped little miss Berry on NSW 80# card-stock, then used Molotow Art Masking Liquid (2.0mm pump marker) to protect the image while I worked on the background. I used two different winter snow trees because I didn't want them all to look the same. 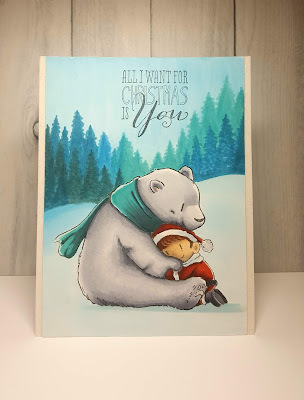 I used a Penny Black Stamp Nature's Friends and Hero Arts stamp Color Layering Snowy Trees. I used some WOW! Opaque White embossing powder on the trees. I masked the foreground Penny Black trees with Post-it paper to then stamp and emboss the Hero Arts trees. I used Distress Inks blended with Ranger Mini- ink Blending tools (Spun Sugar, Tumbled Glass and Broken China) for the sky. I stamped the sentiment from The Ton Stamps Holiday Love Poinsettia in Versafine Black Onyx ink. Then the fun part - removing the masking fluid to Copic color this little cutie!! I also used my Copics to color the snowy ground. I like using a combo of cool greys (COO, C1, C3) and the very light BGs (BG000, BG00) for snow. I also applied a bit of clear Wink of Stella to parts of the snow and on miss Berry. I cut down my card to 4.25" X 5.25" and adhered it to a red A2 side-folding cardbase that I had applied some Wink Of Stella to the bottom for some extra shimmer. So that's it!! I hope you like my card and you try out making some cards with some scenery in the background and masking. It's so rewarding to make these little scenes that make your focal image come alive! !